Bunk Brisbane has a huge range of rooms so whatever you need you will find it here. 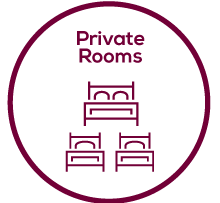 All rooms include free breakfast and the rooms are specially laid out so that whether you are in a 20 share dorm or a 4 share you still get great privacy. All of BUNK’s deluxe rooms are modern, spacious and air-conditioned providing the best hostel experience in Queensland! Centrally located in Brisbane’s Fortitude Valley, BUNK Brisbane has awesome facilities, friendly staff and the best backpacker bar, making it the only place to stay when visiting sunny Brisbane! Even in a budget dorm you get the great facilities that BUNK is famous for. Each bed has a privacy screen, reading light and plenty of secure storage to give you piece of mind. Free breakfast is included every day. All rooms have ducted air conditioning and are for short stay only (maximum 7 days) but don’t worry, because there are great weekly deals on the Deluxe rooms below. Only a couple of $$$ more than the budget rooms but worth every cent! These rooms are recently renovated with brand new air condition to keep you cool all year round. Light and bright bathrooms and Loft dorms even have balconies available. All rooms are ensuite too and great value for money with our free breakfast. You can stay in the heart of Brisbane’s Fortitude Valley in a private room from as little as $42.50 per person. Our budget twin rooms start at just $85 and have all the usual BUNK features with added privacy. Our Double Ensuite rooms aren’t much more so if you fancy stretching out on a big double bed after a big night out then these are perfect for you. These sleep 6 (1 double bed + 2 sets of Bunks) and are set up on the 5th floors with great views to either the Story Bridge or the Valley. Each apartment has a private kitchen and lounge space fully equipped with everything you need to either get ready for a big night out or just for a quiet night in.